Psychoactive herbs such as salvia and kratom may be legal in most states, but are they harmless? For every positive experience reported by someone who ingested a legal mushroom, smoked prickly poppy leaves, or drank ayahuasca tea, it's easy to find a horror story about the same substance. "If you want to try this drug [datura], please consider what the effects of this on others will be...a $20,000 hospital bill…[a visit to a] ICU for days, a CAT scan, ambulance, and specialists. Please take warning," wrote someone identified only as Karrie in a comment on Erowid, a clearinghouse site for information on psychoactive drugs. "Just because it's legal doesn't mean it's safe," says Dr. Ikhlas Khan, assistant director, National Center for Natural Products Research (NCNPR), at the University of Mississippi. Khan's lab checked all 19 sample products that PC World purchased online for this story to determine what they were, and chemically analyzed some of them to determine their potency. Most of the items we bought turned out to be essentially what the packaging advertised. The NCNPR's lab found that some of the items--including Amanita muscaria, Datura inoxia, and Mexican prickly poppy, contained toxins whose effects may be mild or deadly depending on the dose and sample strength. Other substances, such as kratom, Khan says, are known to be addictive. According to the lab, another substance, kanna, is a weak narcotic similar to marijuana. One product, however, wasn't quite as represented: A substance billed as the powerful hallucinogen 5-MeO-DMT (short for 5-methoxy-dimethyltryptamine, according to Wikipedia) turned out to be a benign muscle stimulant called 5-Methoxytryptamine, UM researchers said. All of the sites where we bought products for this story displayed disclaimers stating that their merchandise was not for human consumption. 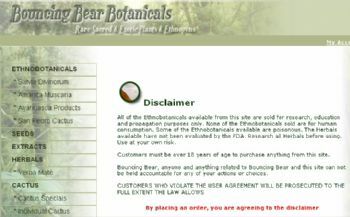 The site Bouncing Bear Botanicals, for example, states in its easy-to-find disclaimer: "All of the Ethnobotanicals available from this site are sold for research, education and propagation purposes only. None of the Ethnobotanicals sold are for human consumption. Some of the Ethnobotanicals available are poisonous. The Herbals available have not been evaluated by the FDA. Research all Herbals before using. Use at your own risk." Nevertheless, comments elsewhere on some of the sites we visited seemed to anticipate that buyers might not draw the line at research, education, and propagation. Though SalviaSupply.com says that its products are not for human consumption, its description of the Amanita muscaria mushrooms we bought there focused on their effects on a person who consumes them: "The Amanita trip typically begins with feelings of euphoria and peaceful bliss. As the muscimol sets in, individuals can experience intense psychedelic effects, such as auditory and visual hallucinations." On the Erowid site, accounts from people who actually took Amanita muscaria made the experience sound far from tranquil (many of the users don't specify where they bought the drug). "I believe it as [sic] more of a poison than a drug, and I would wish this on no one, not even my worst enemies," wrote a poster identified as ACMDrugs, who said he'd eaten over 20 grams of Amanita muscaria that he purchased from a botanical Web site. "If you eat Amanita muscaria you are essentially exposing yourself to a poison that gets you high," Khan says. "These are toxic substances potentially dangerous to your health," Khan says. A person who takes the drug can experience a range of symptoms from mild nausea and fever to death, depending on the level of toxicity in the dose, Khan says. While the NCNPR researchers did not measure specific levels of toxins, Khan said that datura was potentially the most toxic of the samples we purchased. Bouncing Bear Botanicals, the site that sold us dried Datura inoxia flowers, states that "Datura has been utilized as a shamanic, magical, and religious tool for centuries." But the site does go on to warn customers that ingesting it can be fatal: "Datura is an extremely poisonous plant. Their [sic] have been many reported fatalities from accidental poisoning and people seeking a thrill. We strongly discourage anyone who is contemplating ingesting any part of this plant." At least one death may be associated with the consumption of datura. In 2007, 15-year-old William Hodge of Albuquerque, New Mexico, was found floating just beneath the surface of a lake after he and two friends drank tea they had brewed from Datura stramonium (jimsonweed) that they found growing wild in a park, according to a report in the Albuquerque Tribune. The official cause of death was drowning; but Hodge's mother, Toppin Hodge, says that her son was an excellent swimmer. She believes that datura's disorienting effects were the underlying cause of William's death. Officials of the New Mexico Office of the Medical Investigator reported finding an almost empty container of jimsonweed tea at a campsite where Hodge had spent time leading up to his death, according to Anthony Cervantes of medical investigator's office. Albuquerque authorities say that the New Mexico Poison Center receives 10 to 15 calls a year for poisonings from jimsonweed. Toppin Hodge says that her son learned how to make the tea from information found online. "A lot of young people turn to the Internet to research legal ways to get high," Khan says. "There is a lot of misinformation about these substances on the Internet and what their effects are on those that take them." Most troubling to Khan is the failure of many sites selling these substances to provide the kind of precise information that he says users need in order to protect themselves from harm. 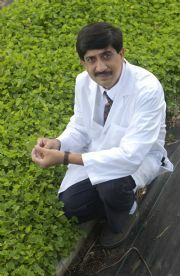 When buyers don't know how potent or how toxic a plant is, the risks associated with ingesting it are especially high. "With some of these substances it's like playing Russian roulette with your life," Khan says. "With others the risk is on par with smoking one [tobacco] cigarette." Teen wrote that "Salvia makes me realize that humans have no reason to be on Earth."